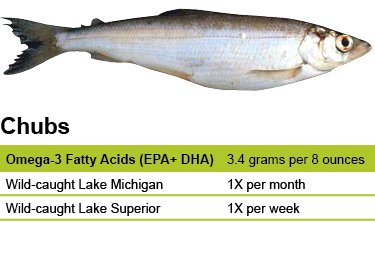 Bloater chubs have the highest amount of omega-3 fatty acids (EPA and DHA) of the Great Lakes commercial fish species—more than sockeye salmon. They are very oily, and they make a wonderful smoked fish. When they arrive fresh to a smokehouse, chubs are soaked in a salt brine overnight and then placed in the smoker for about five hours. Many chub species used to be harvested commercially, but today bloater chubs make up the bulk of the chub fishery in Lakes Michigan and Superior. They are fished with gill nets, and the demand for them far exceeds their availability. State health agencies have found that it is safe to eat Lake Superior bloater chubs once a week and Lake Michigan bloater chubs once a month. If you are unsure of the origin of your chubs, you should follow the most restrictive recommendation (once a month). Historically the bloater was a small chub species of little value. However, environmental advantages have resulted in increasing numbers and size, and the bloater has become the most important species of chub remaining in the fisheries of Lakes Michigan and Superior. In Lake Michigan, bloater chubs exploded in numbers because their top predator, the lake trout, was disappearing from overharvest and sea lamprey predation. In Lake Superior, bloater chubs became prominent because all of the larger chub species were overharvested. Like many Great Lakes fish, the bloater chub population has always had cyclical highs and lows. There is some evidence of peaks in both 1960 and 1990, possibly indicating a 30-year cycle. However, the invasion of zebra and quagga mussels has affected this natural cycle, possibly because the two mussels compete with young chubs for food. Since the 1990s, bloater chub numbers have been in decline. Scientists are trying to find out if bloater chubs will rebound on their own as they have done historically, or if competition from invasive mussels has altered their natural population fluctuations. The owners of The Cove in Leland, Michigan, trademarked a cocktail called the Chubby Mary® that food writers often highlight. It’s a Bloody Mary with a smoked chub in it.